Just got in the latest new sheet from Empire City Decals. This one is a bit different as it is an armor sheet. This one covers the Soviet T-55, a tank that was a mainstay of many armed forces in the 1960s and is still in service with some. Since it is a tank sheet, there are not a ton of markings so there are marking for 24 different tanks. Most of them are in a dark green or a desert tan scheme. However, some have a variegated scheme that should provide considerable interest. 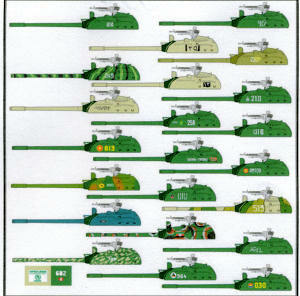 The decal placement guide shows only the turret as that is where the majority of markings were on these tanks. You are on your own as to the rest of the hull for some of these camo schemes, but I'm sure that the references cited will provide you with much more information. Allow me to quote from the placement guide as to what is offered. Unless stated, they are in green. 1. White 364 of the Afghan army in the 1960s. 3. White 739, Uganda 1978. Many earth colored splotches all over the tank. 5.White 212, Cuban Army, Angola 1980s. 10. Syrian Army 1967. No number but a patriotic slogan painted on the turret. 17. White 10052, Slovenian Army 1990s, dark green and earth splotches. 18. White 140202 South Lebanon Christian Militia 1980s. 20. White 210, Mongolian Army 1980s. 24. White 682, Peruvian Army 2007. The full color decal placement guide also shows where some of the forward hull markings are to be applied for a few of the schemes that use them. The sheet itself is very nicely printed by AviPrint in the Czech Republic so they will be quite thin. If you are thinking of a 1/35, T-55, then you really should get this sheet. My thanks to Empire City Decals for the review sample. You can get yours direct from the hyperlink.